Are you like this hamster on the wheel? Stop going round and round. 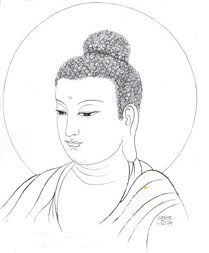 It was on the full moon Poya day in May that Siddhattha Gothama, became fully enlightened. This day is now called Wesak, Waishakya, or Wesakha, depending on the language. Siddattha was an ascetic then.He became known as the Buddha Gothama, after his enlightenment. The tree beneath which He was sitting at this time came to be known as the “Bodhi” tree. What He realized at enlightenment was that it is “craving” that causes endless suffering to beings. Craving or desire by ever creating the “be - ing”, the so called “me” that leads to delusion makes all beings suffer relentlessly. After His enlightenment He spent seven weeks under and around the “Bodhi” blessing the tree that gave him protection and shade during His time of striving. Nobody else came to his aid. Thereafter, on the eighth week he set forth to Isipathana, where the five ascetics who cared for him thus far [i] were residing at “Migadhaya” (the Deer Park). He set forth thus, to teach them the Dhamma, to show them the path to end suffering. 1. The Truth of Suffering evident in life. This teaching is called the “Dhammachakka - pavaththana sutta”, because Dhamma means the truth, chakka means the wheel, “pavaththana” literally means setting in motion. Thus, He set the wheel of Dhamma rolling. He revealed to the world the cause of suffering, the cessation of suffering and the way to the cessation of suffering which is today called the Noble Eight Fold Path. This is the Discourse on keeping the wheel of Dhamma rolling. In this discourse the Buddha taught the eight fold path, the way to end suffering. Towards the end of his discourse, one of the five ascetic listeners, named Kondañña became enlightened. We say that he became a “stream-winner”. The English meanings of the eight fold path are given below. Even though Wisdom leads the list, in practice it is Virtue that leads. Virtue means a high standard of discipline. Discipline will make you honour the precepts like not being dishonest to your partner, if you are married. If you are celebate keep with the Brahmachari precept. It is this discipline which will make you not lie or cheat. When you conscience is clear, you find it easy to reach the Stillness in Samadhi. Samadhi is the second step on the path after Virtue. Reaching the stillness of mind which is called Samadhi, in Jhanic Bliss etc., you will be able to see that there is “no-self”. Seeing that there is no self to call, me or mine, is the dawning of Wisdom, the first realization on the enlightenment path. So you see, Seela leads to Samadhi, and Samadhi in turn leads to Wisdom. Coming face to face with life we have to accept that, there is Suffering. There’s no denying that! What do ordinary people like us have in common with Obama, Bin Laden, Queen Elizabeth or Kate Middleton. It is suffering. Every life has to face this in one way or another. We all have to undergo sicknesses, ageing and death, not to mention all the other upheavals we have to bear, in between the day were born till the day we die. As if this normal dose is not enough, terminal diseases like cancer and “telling on you” diseases like Alzheimer etc, also get introduced into life. Then the pain of separation from loved ones, problems of divorces, problems of children, traumas, poverty, natural calamities, recessions etc. etc. gets the people exhausted. These are all the stuff of life, the plain truth even though you may like to think it otherwise. You can never wish them away. 2. The Cause of Suffering. The Buddha found that the cause of suffering is initially craving. Craving for sense pleasure, craving for existence, craving to control and have power. Any kind of craving falls into one of these three categories. Once this craving stops, (the pristine) Peace of mind arises in its stead. It is natural for the mind to be in Perfect bliss, and peace when it is free of the three fold cravings. If one just be happy with whatever is in the present moment without wishing for things (in the future), nor lamenting (on the past), but be in the present moment, it would really lead him to a lot of happiness, contentment and peace of mind. This process is quite natural. By letting go of the past and future, one can naturally realize this peace. There is a way out of suffering. This is called the Noble Eightfold Path. Also called the middle path as it does not tilt towards luxurious living nor self mortification. It is a very balanced way of life, which would lead to contentment and peace. [i] The five Ascetics were attending on Him anticipating that He would become fully enlightened through severe ascetic practices, that nearly killed Siddhattha. They left when He accepted the meal of milk rice offered to Him by Sujatha, thereby breaking the severe ascetic practices of not eating. Hedid this as He realized that severe ascetic practices will not lead to enlightenment.